The Sister Parish Committee of Las Margaritas II. In 1993, the relationship with [St Francis of Assisi] and Las Margaritas began. They came to search for and to get to know another church and the life here in the community, to share and exchange experiences. It was also during the times of war and the people suffered a lot in the Ixcan. Fr. 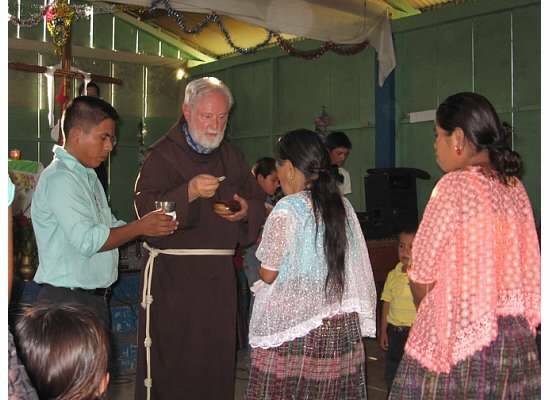 Emmet Murphy, a priest associated with St Francis of Assisi, celebrates communion with members of Las Margaritas II. Through the years we shared our joys and pains together. On the first delegation they came with a priest and many years have passed since that first delegation. We are simple people, but they still wanted to come and share with our church and families. That means more to this community than I think they know. That is why we have worked together as a church and community to always receive them. They have also done the same for us. We have a friendship of equality where there is no difference in color, economic status or faith. Members of Las Margaritas II and St Francis of Assisi. Las Margaritas was founded in 1986. 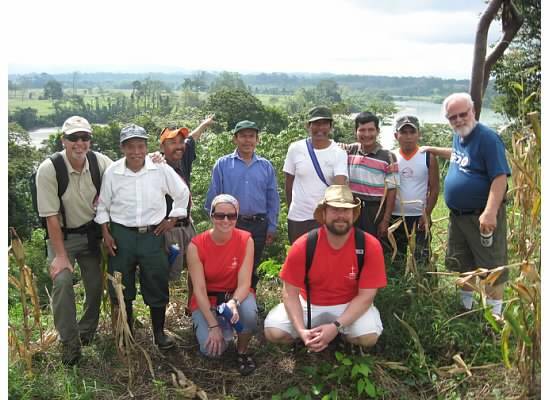 So, when the first delegation came to Las Margaritas, it was a new community. The people in Las Margaritas are from different places in Guatemala: Coban, Quiche, Senahu, etc. But here is where we came together. Some people were searching for land, others for a place to find food to give to their kids. At that time there were no roads. You had to cross the river in a boat. That is something that [the St Francis of Assisi delegates] can attest to. Every time they visited us they had to cross the river. Sometimes there are strong currents but thank God nothing ever happened to our brothers and sisters when crossing. We haven’t had many opportunities to receive a lot of foreigners but thank God we have had the opportunity to receive our brothers and sisters [from Raleigh]. To date, we continue our relationship with them. We pray that God always guides our paths. This is our story. It is a story where borders do not exist and we hope that God continues to bless this linkage and its future. Aside | This entry was posted in 25th Anniversary, General, Guatemala and tagged 25th anniversary, las margaritas ii, st francis of assisi. Bookmark the permalink. What a powerful reflection. Please thank Jose for sharing this with the Sister Parish community. He so eloquently speaks to the value of the hermanamiento.